Dhaka, Aug 22 (Just News): BNP senior leaders failed to meet their chairperson Begum Khaleda Zia at the Old Dhaka Central Jail in the capital on the Eid day on Wednesday. Senior BNP leaders, including standing committee members and vice chairmen, along with nearly two hundred party leaders and activists headed for the jail gate around 12 pm to meet Khaleda Zia. They showed the letter that they sent to the Home Ministry seeking permission to meet Khaled but police said that they were not aware of that. 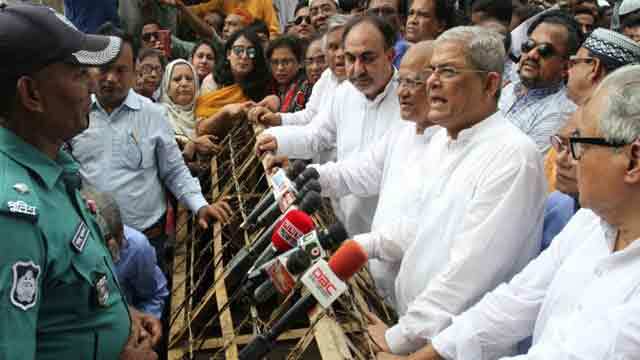 Talking to reporters after being obstructed, BNP secretary general Mirza Fakhrul Islam Alamgir said thought they sent a letter to the home ministry for meeting Khaleda Zia, they could not. It as 'unfortunate', he further said. ‘As per rules, prisoners can receive visitors on Eid day, but police are not allowing us to meet our beloved leader. It's very painful,’ he said. At least 13 senior leaders went to meet Khaleda Zia at jail, including BNP standing committee members Dr Khandaker Mosharraf Hossain, Mirza Abbas, Nazrul Islam and Abdul Awal Mintoo. Earlier in the day, Mirza Fakhrul along with BNP leaders and activists went to its founder Ziaur Rahman's grave at Sher-e-Bangla Nagar and offered fateha there. On February 8, Khaleda Zia was sent to jail after a special court sentenced her to five years' rigorous imprisonment in Zia Orphanage Trust graft case.